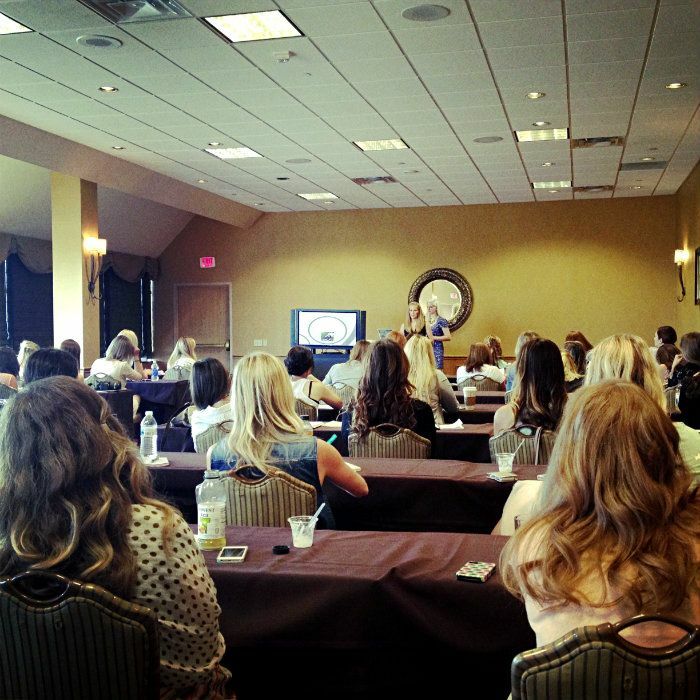 I blog to chronicle my life and to explore my personal style. But when you get past those surface-level reasons, there is SO much more to blogging and why I love and do it. Blogging takes a LOT of my time. When my kids go to bed, I'm a blogging fool. I'm usually exhausted most mornings because of staying up too late doing blog stuff. I know this sounds like I'm complaining (I'm totally not), but I'm trying to prove a point that for one, I choose to do this and love it...and two, it's all worth it when you get to meet, hang out with, and truly connect with other girls with whom you've only corresponded with online...or maybe never before have "met" at all. I knew this was the main thing I went to the conference for. To connect with other bloggers and brands. And it sure didn't disappoint, as depicted in my motherload of iPhone pics below (didn't even attempt to take my big girl camera). 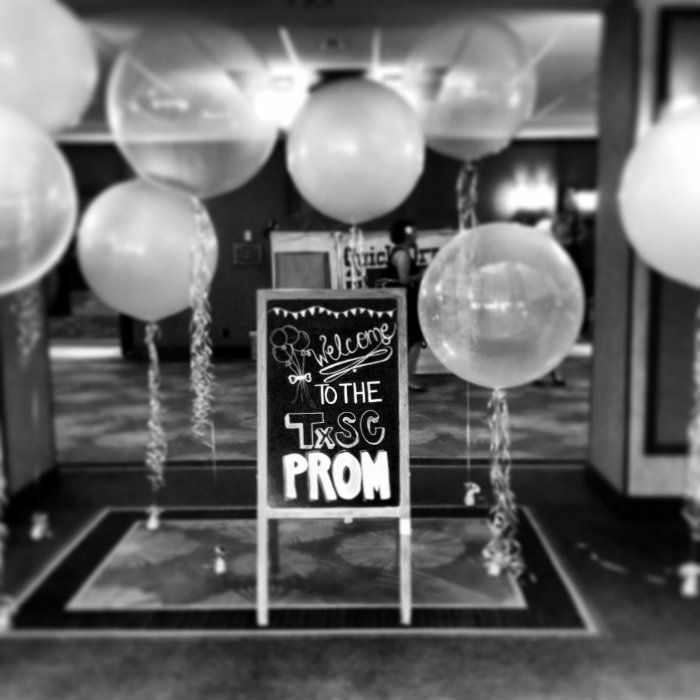 The entrance to the ballroom for Prom was so cute and perfect for the occasion! 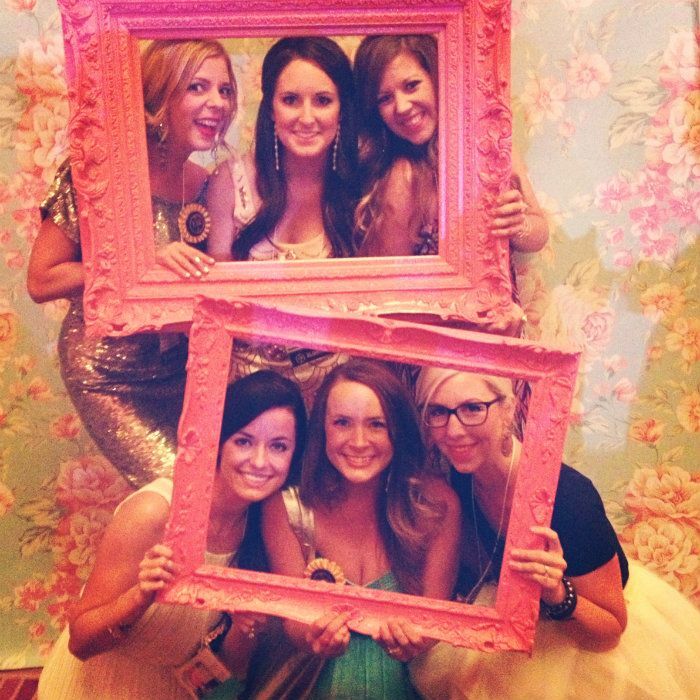 Ruche had the most darling photo op complete with colorful frames, fascinators, and other shabby-chic props. 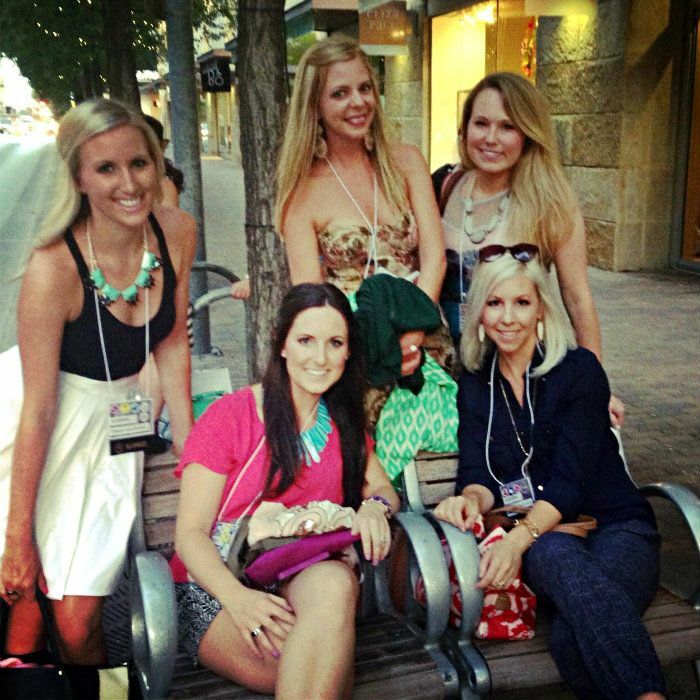 I loved chatting with the Ruche girls and doing our little Austin Blogger photo!!! More photo-ops at prom...and one random one of my and Jenni when we had to sit on the floor in the back of a session because it was so packed. We were obviously paying close attention and certainly not playing on our phones the entire time. Thankfully this photo is really grainy, because otherwise, you'd be able to see the intense amount of sweatiness that attacked us all. This was outside of the Lulus swap on 2nd street...we had to go outside in the 102 degree heat to get a breather from inside the party. I'll let that sink in for a sec. Yeah...that's how crazy it was inside. But fun nonetheless. Right after this pic, we all went for some yummy tapas at Malaga. If you follow me on Instagram, you might have seen these two above....on the left was the booklet the girls from A Beautiful Mess gave us for their keynote address. I love these girls even more now! 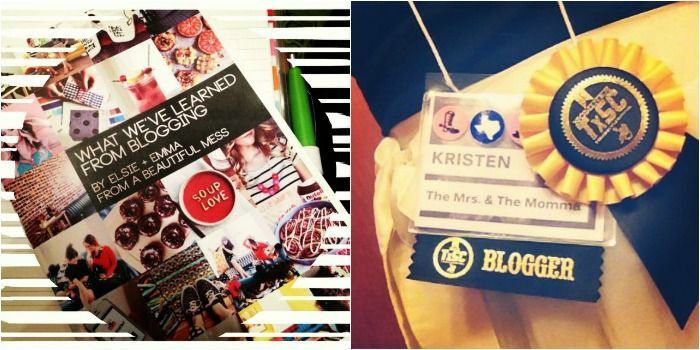 On the right is my conference badge with my Best Dressed nominee ribbon. Thanks so much for Lulus for nominating me...it made my night! I'll devote a whole post later this week on specific bloggers...my friends, ones I met and loved, and those who you must definitely follow (if you don't already). I hope you're having a fabulous week so far and just as a PSA... for those of you who don't use Instagram...please get on that at your earliest convenience. You'll love it, I promise. great photos! looks like such a fun time! Can I come with you next year?!! I want to hear more about this clothing swap. How did that work exactly? That is SO true, Kristen! Blogging is such a multi-faceted hobby! I like blogging about the things that appeal to me, sometimes it's cooking, sometimes it's crafts, sometimes it's style, sometimes it's my life as a mom. 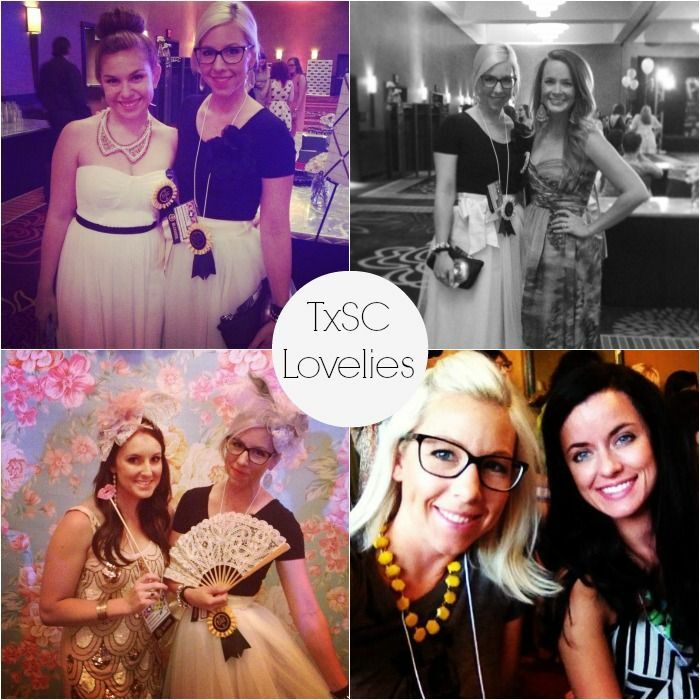 But beyond it all, there's the connection I create with other bloggers. It is the reason why after a two year hiatus I decided to come back, because it left a bit of a gap. :) I looove blogging! I can't believe we met, and that you know Erin and Austin! 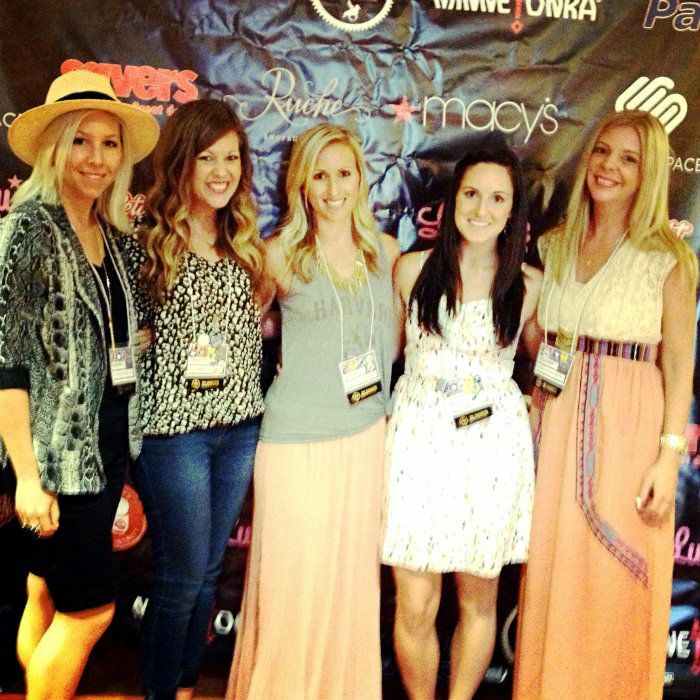 Such a small world and I am so happy that blogging brought us together! I can't wait to read your iPhone tips for photography! I have the best intentions to use a real camera, but I never seem to have it in reach!